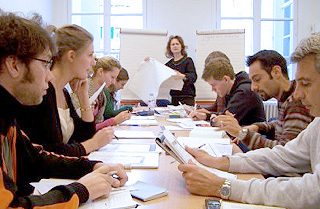 At French Communication Institute, French language and culture are taught in context through a variety of reading, writing, listening, and speaking activities, which promote interaction not only between the instructor and the students, but most importantly among the students themselves. To ensure maximum progress in minimum time, all classes are taught by highly qualified and trained native speaking professionals. Beginners and Intermediate levels meet twice a week for 1 hour and a half. The Advanced level meets once a week for 2 hours. An evaluation is given to each client prior to the first class meeting to assess his or her level of placement private, semi-private or small group of 10 students maximum.